Phantoms are out to make amends in front of their own fans by claiming derby glory. 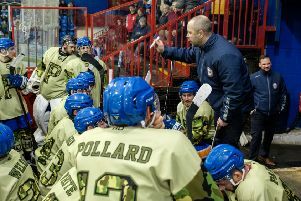 The city team suffered a shock first defeat of the NIHL Division One South season when London Raiders triumphed 6-3 at Planet Ice last weekend. And while Slava Koulikov’s men delivered a fine response to win at Swindon 24 hours later, they are now determined to put on a show for their supporters this Saturday when entertaining Milton Keynes Thunder (7pm). It is the second instalment in a new local rivalry and Koulikov is keen for his men to follow up an early-season triumph in Buckinghamshire with two more points. “It was an intense game in MK,” said Koulikov. “Teams always have that bit of extra motivation in a derby game and I don’t expect Saturday to be any different. “It was also a very tough game as we were behind at one stage in the second period before we managed to get ourselves back ahead and kill it off in the third. “The games are becoming more competitive all the time and that is a good thing as far as I’m concerned. “I’m sure our fans were disappointed to see us lose last weekend and everyone is entitled to their opinions. “We need to adjust to games getting tighter and we didn’t quite do that against London. Phantoms then head to the scene of their other defeat so far this season on Sunday. They go to Hull for another NIHL National Cup Group B game against the Pirates (5.30pm). Koulikov’s men were beaten 6-3 in their previous visit to the Hull Ice Arena in the opening weekend of the season, but replied with an 11-6 victory when the sides met at Planet Ice last month. They are Phantoms’ only two outings to date in the group stage of a competition in which they will face Hull and Sheffield twice at home and twice away. “Hull is not a place where we have enjoyed much success,” said Koulikov. “We’ve only won one out of three games there in the English Premier League in the last two seasons. Phantoms continue to be without defenceman Greg Pick due to a groin problem. Forward Conor Pollard, who was recently promoted to the Phantoms roster along with twin brother Nathan, will not now feature for the team. He will instead continue to play for the Phantoms 2 side in NIHL Division Two South.